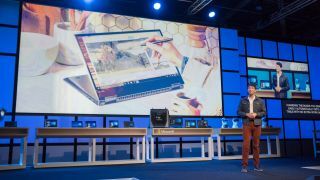 At IFA 2017, Microsoft announced the Windows 10 Fall Creators update will release on October 17. We’ve known the fourth major update for Windows 10 coming later this year and with a name that starts with Fall, it was pretty easy to predict which season it would release in, but now we have an exact firm date. Microsoft didn’t reveal any new features on stage, but instead chose to remind us of features we already knew about. Among the few it mentioned, Windows Story Remix will allow users to automatically turn a collage of images into a cohesive narrative. Windows Mixed Reality headsets were also a big piece of the press conference and Terry Myerson also revealed that the many models we’ve seen from Asus, Lenovo, Dell and Acer will also release on October 17th. We’re sure to see early developer previews of the Fall Creators update, so stay tuned for our impressions of the next version of Windows 10 soon.